What Would You Do? is a semi-regular feature in which a question will be posed based on a character or story line in a book I've recently read. I'd love if you would take part and share in comments just what YOU would do in a similar situation! I really like Susane Colasanti. I like her happy-making, gentle, romantic stories. I'm always excited to read a new story by her. 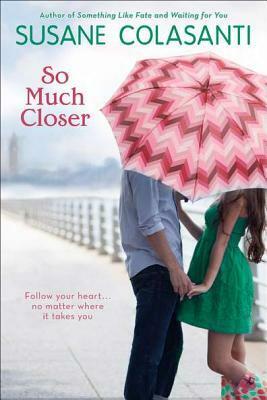 And while So Much Closer isn't one of my favourites by her, I still enjoyed reading it. The premise of the book (teen girl uproots her entire life to move to another city to follow her crush, a boy she doesn't know very well) sounds very similar to one of my favourite television programmes (Felicity!). So I wasn't entirely sure when I started So Much Closer if that similarity would help or hinder my enjoyment of the book. Even so, this post is not about those things. This post is about something the main character does which I found to be quite interesting. I've seen it done other places and I've always wanted to try it. This thing Brooke does is that she writes down her wishes and goals and puts those wishes into a box to keep track of. I like that idea. To first put into actual words your heart's desire, to write them down so that they're out there and that they are real is something I'm drawn to. For a lot of my life, I've been too afraid to even acknowledge that I have wishes and goals. Isn't that sad? Those little wishes, like 'I really want X for my birthday' when I was little or the 'I wish (my biggest current crush) would notice me' wishes in high school - none, or at least few, were voiced. It's only later, looking back on things can I admit to myself that I really wanted this or that. I was too afraid to go after what I wanted for a very long time and sometimes even now, it feels a little bit wrong to want things. But here, now, if I were to write down something to add to my Life Wishlist Box (I'm sure Brooke calls it something better than this, but I don't have the book to hand), this is what might be included. I'm not talking about the travelling I want to do (Alaska aside). I'm talking about the goals and wishes personal to you, the ones buried inside your heart. What are your life goals? Oh good luck with your goals Zoe! I'm sure with some hard work and a little dedication you'll get there too!